Flip a coin until you get tails. This attack does 20 damage for each heads. It checks out whatever’s around it by licking everything. If you don’t clean off a spot where it’s licked you, you’ll break out in a rash! How many proxies would you like to print? Flip 2 coins. This attack does 50 damage for each heads. Its tongue is twice the length of its body. It can be moved like an arm for grabbing food and attacking. 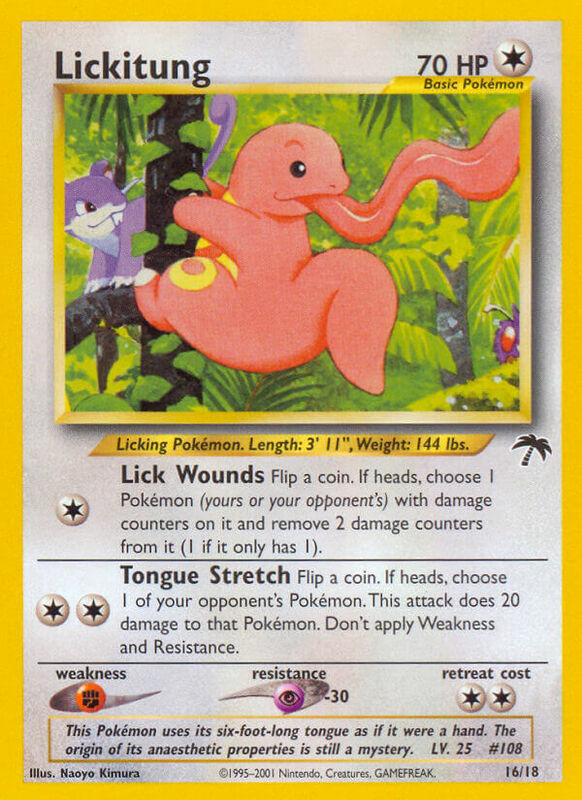 Rating for this card is currently disabled. Flip a coin. If tails, this attack does nothing. Its long tongue, slathered with a gooey saliva, sticks to anything, so it is very useful. Choose 1 of your opponent’s Pokémon. This attack does 10 damage to that Pokémon. This attack’s damage isn’t affected by Weakness or Resistance. Choose 1 card from your opponent’s hand without looking and discard it. When it extends its over-six-foot-long tongue, its tail quivers. There is a possibility they are connected. Flip 2 coins. This attack does 20 damage times the number of heads. 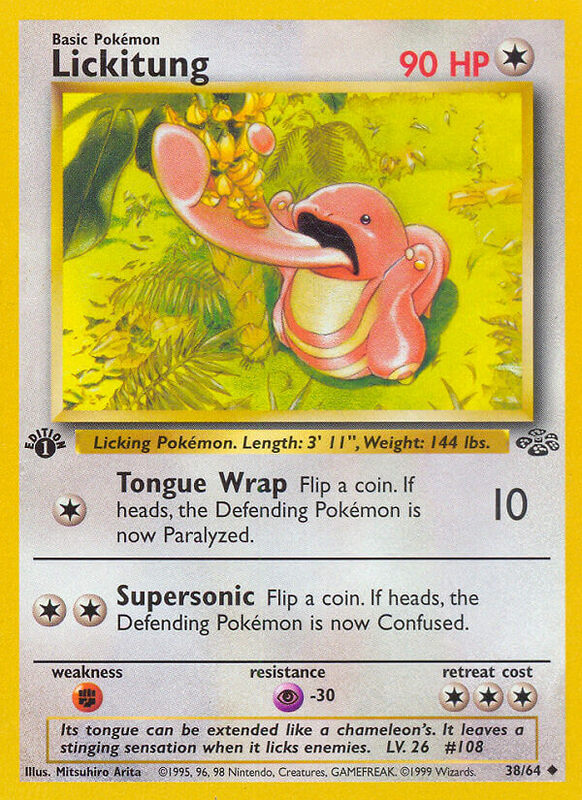 Instead of hands, it uses its tongue, which is twice its height. Its sticky saliva grips anything. Flip a coin. If heads, this attack does 10 damage plus 30 more damage. Put 1 damage counter on 1 of your opponent’s Pokémon. 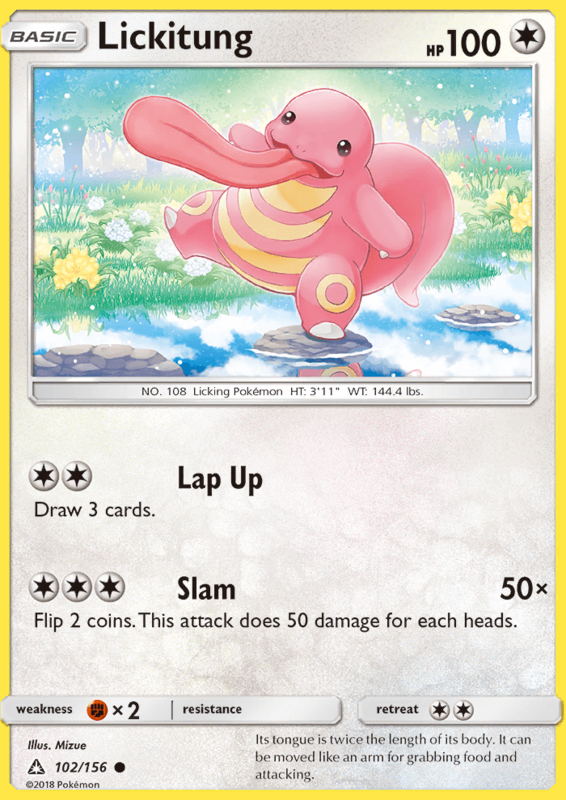 If that Pokémon has δ on its card, put 3 damage counters instead. Choose 1 of your opponent’s Pokémon in play. This attack does 10 damage to that Pokémon. Don’t apply Weakness and Resistance. Flip a coin. 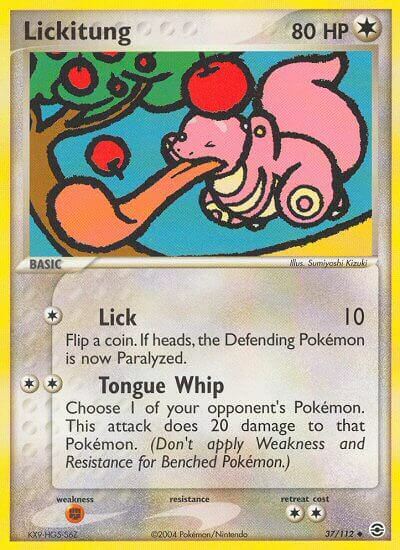 If heads the Defending Pokémon is now Paralyzed. Flip a coin. If heads, choose 1 Pokémon (yours or your opponent’s) with damage counters on it and remove 2 damage counters from it (1 if it only has 1). Flip a coin. If heads, choose 1 of your opponent’s Pokémon. This attack does 20 damage to that Pokémon. Don’t apply Weakness and Resistance. 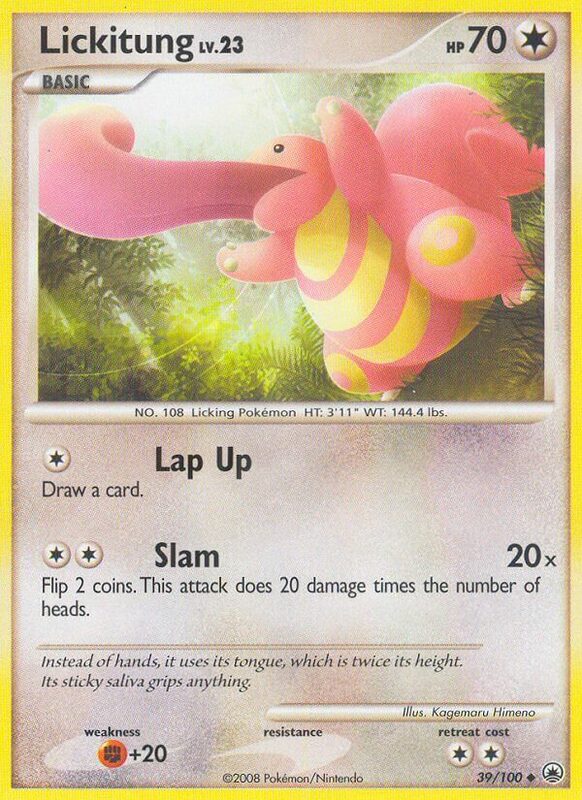 This Pokémon uses its six-foot tongue as if it were a hand. The origin of its anesthetic properties is still a mystery. Flip a coin. If heads, the Defending Pokémon is now Confused. 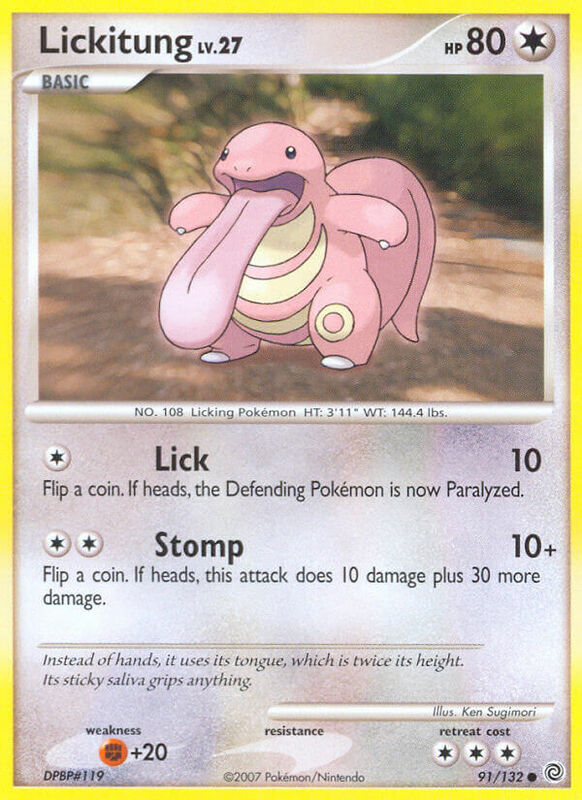 Its tongue can be extended like a chameleon’s. It leaves a stinging sensation when it licks enemies. The literal and graphical information presented on this website about the Pokémon Trading Card Game, including card images and text, is copyright The Pokémon Company (Pokémon), Nintendo, Game Freak, Creatures, and/or Wizards. This website is not produced by, endorsed by, supported by, or affiliated with Pokémon, Nintendo, Game Freak, Creatures, or Wizards. Card prices represent daily market values provided by our affiliate, TCGplayer. No guarantee is made for any price information. See stores for final prices and availability. 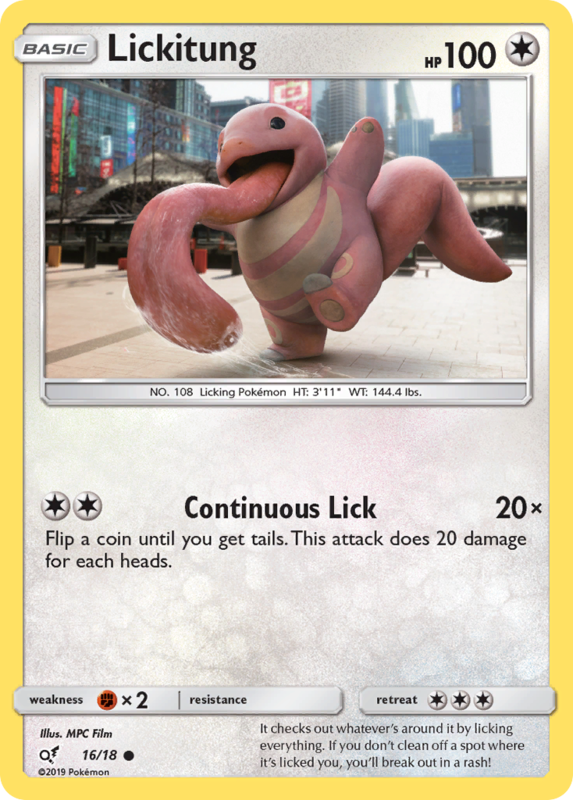 All other content © 2011–2019 PkmnCards.